Thornham composite mill, built c.1863 in Staithe Road, just to the northwest of the village. The postmill buck rather than being mounted on a central post, was mounted on the curb of a single storey 6' 6" high red brick roundhouse that had a slight batter and rotated into the wind via the curb. 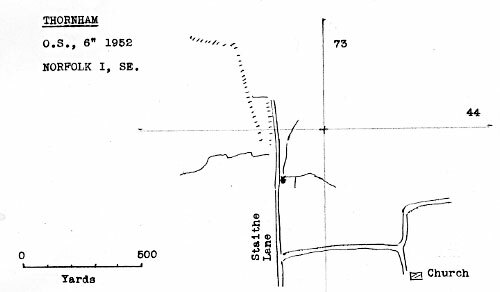 The roundhouse had an internal diameter of 11' 6" and the walls were 18" thick at the base and 15" at the curb. The brick base was custom built to accommodate the mill buck, as it was not big enough to be a cut down towermill. The single pair of French burr stones and a flour mill were powered by 4 double shuttered sails, each having 5 bays of 3 and mounted on a wooden windshaft that was mortised to take the stocks and striking was via a rack and pinion. The entrance was via a leanto porch accessed from the ladder and the fantail was on a tailpole carriage set on two tandem cartwheels. 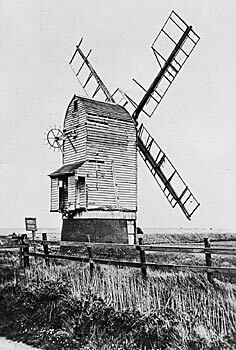 The mill buck was originally part of Ringstead_southern_mill and was moved about 2 miles east to Beacon_Hill in Thornham c.1840. Up until 1863 the Rate Book in Thornham only records John Crane as owning one mill in Staithe Road but by that year both mills were there. Thus the Ringstead_postmill buck may have been moved from Beacon Hill and reassembled in Staithe Road in 1863, becoming the composite mill. 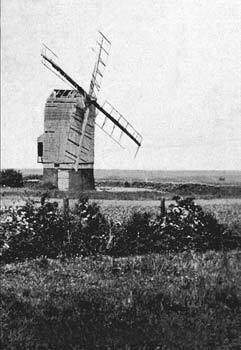 Rex Wailes commented that the Thornham mill was smaller than Banham composite mill. Wind Mill, one pair French burr stones, with flour mill complete. 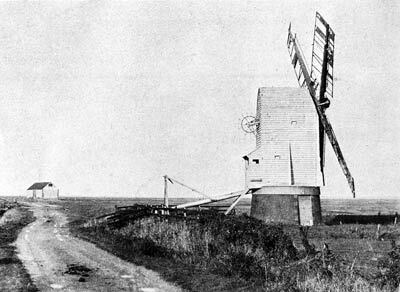 One of the mills was removed to Thornham, by the road leading to the granaries, where it now is. The site was purchased by Henry L'Estrange Styleman Le Strange, who erected the present mill. 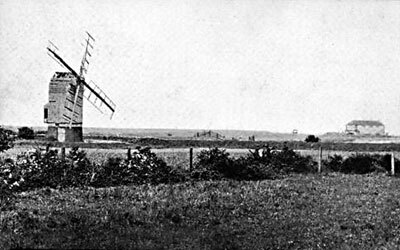 I believe the windmill used to stand in a field between Long Wood and Beacon Hill but it was moved from there and taken down to the south end of the creek...here it stood and worked from about the 1880s (1863) onwards. Very derelict. Might come down at any time. Has no post and is mounted on a curb with side and top rollers, but no rack. Presumably it was pushed around with a tailpole. The entrance to the porch is at the side and the striking gear is operated from it. The single storey house is of red brick. The brake wheel, brake and windshaft are all of wood and the sack hoist is worked by a chain from grooved pulley behind the brake wheel. N.B. The c.1925 photo at the top of the page shows the derelict mill with a tailpole that is braced to an upright that could be the remains of a fantail. Mill also has a normal ladder to the rear. John Crane was born in 1792 and died c.1865. His son Thomas Crane was born in 1819 and died in 1896. His daughter Elizabeth Crane was born in 1823 an died in 1900. Elizabeth Crane took over the mill on the death of Thomas Crane in 1896 and she employed Howes Tipple as miller, until she died in 1896 and the mill ceased working. Neil Holmes of Thornham, wrote to Harry Apling on 26th September 1981 and told him of a painting by Victor Ames of Thornham Ironworks, who died in 1934. The painting depicted the mill with 4 double shuttered sails, ladder and the complete fantail on the tailpole with two tandem wheels. The painting was probably c.1900. Neil Holmes of Thornham wrote to Harry Apling on 20th November 1981 to say that he had examined the Rate Books 1842 - 1890. John Crane had one mill in Staithe Road up to 1863. In 1863 two mills are recorded in his name in Staithe Road. Two mills are given until 1886, when in the name of Thomas Crane. In 1887 only one mill was left. Harry Apling recorded on 5th December 1981, that in Thornham church there was a model of the composite mill. It was scaled at 1 in. to 1 ft. and stood in the centre of a reconstructed left handed 4 ft. French burr stone. The tailpole held a 6 bladed fantail. Neil Holmes believed that the stone under the model came from Brooke's_mill and had actually been on his farm on the main road, where it was found by neighbour Arthur Richmond, who pieced it together. He believed it had not come from the composite mill as thought locally. At last I now know what the Thornham windmill looked like having been visiting the village since 1949, camping in the field adjacent to the Lifeboat Inn, owned then by Oswald & Olive Waterfield. The present owner of the Lifeboat has totally vandalised the area, and I no longer visit when near Thornham. After the mill was dismantled, the wooden windshaft with its wrought iron strips let into the journals to form a wearing surface, was donated to the Bridewell Museum in Norwich along with the blue marble neck bearing let into an oak block and secured by lead and plaster. Later both were moved to Gressenhall Rural Life Museum. 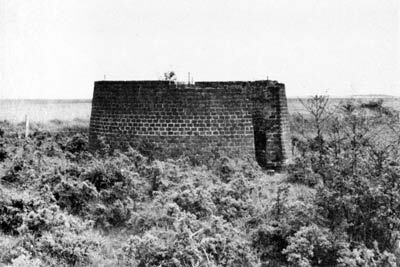 The single storey base remained for many years.